Business owners in and around Sunrise can stop their search for a custom sign company when they see what Testa & Sons Signs can do for them! Located in nearby Hollywood, the professionals at Testa & Sons Signs have been in business for many decades and have worked with hundreds of business owners in and around Sunrise with their custom sign projects and installations. Truth be told, you simply won’t find a better sign company in Sunrise. You can trust in Testa & Sons to put maximum effort into manufacturing the best quality signs for your business and community. We also securely and properly install all of our custom signs because we want your product to be able to attract the necessary attention. Each sign we design and place receives the care it deserves just as each customer gets the proper amount of attention they deserve. Our sign company in Sunrise has a reputation for being the best, and this is important to us, which is why we only do the greatest job with each project. Testa & Sons Signs has as good a reputation as it does for a reason. We work diligently and effectively to create the most enticing and tactical business signs in Sunrise so that your business can reach its full potential! You won’t find a better company that produces as attractive and relevant signs in Sunrise. We truly strive to provide you with the best so that your company is set up to succeed. As the best sign company in Sunrise, we are committed to doing what the competition won’t – caring for your specific sign needs and making it happen! At Testa & Sons Signs, we believe in providing you with options to choose from. We understand that you may be in need of more than just a custom sign in Sunrise. This is why we offer a number of unique sign services such as sign repair and sign installation in Sunrise. Let us be the team you call to properly install our custom signs and take care of sign repair when necessary. There are all different types of signs that you may need. Whether it be a business sign, standard sign, light up sign, or another type of unique sign, Testa & Songs Signs wants to help you strategically place and correctly install your sign. At Testa & Son Signs, you can depend on the high quality sign design, sign repair, and sign installation in Sunrise. But we don’t just provide these services for your business – we also offer sign services like residential signs, street signs, sign removal, and more. 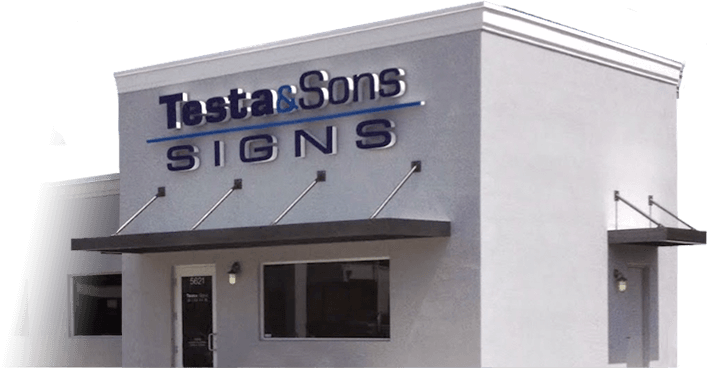 The next time you need professional signage or custom signs in Sunrise, remember that the best company to turn to is Testa & Son Signs! We take quality and efficacy seriously at Testa & Sons. That is why we make sure we have a high quality product to show each of customer’s upon completion. Call the experts at Testa & Sons Signs today for more information on what we can do for you and your project! No size is too big or too small!